Chad goes to the mothership for his aneurysm surgery; Ryan tells Valerie he's a V; Erica and her cohorts press their captive for information. It's a nice moment when the normally imperturbable Anna gives a slight reaction when Marcus delivers her the news of a human woman pregnant with a half-Visitor baby at 3:30 in the episode. Notice also that Marcus refers to themselves as V's. Seems a bit odd...wouldn't he use whatever is their own name for their species? Anna says that the existence of the hybrid baby puts their entire species at risk. Why? She mentions that the hybrid could be born with human emotions such as love. Why does this bother her so? Because of this new development, she orders the acceleration of all initiatives of the Live Aboard program and for all the motherships to begin the "extraction procedures" on their human residents. Is she trying to create hybrids under her own command? 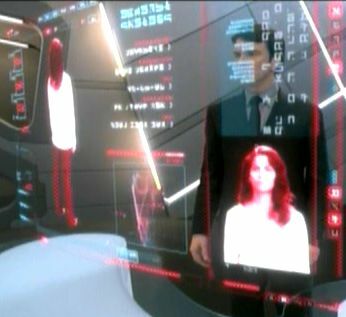 The Fifth Columnist Visitor Dr. Pearlman seems to confirm that the R6 formula the Vs have been administering to humans at the healing centers is designed to allow the Vs to track individual humans. She says it masks its presence in humans as saline and gives Valerie a shot whose acidity will neutralize the tracking function within 24 hours. At 10:00 in the episode, Chad reveals to us it has only been a few days since he told his viewers about the aneurysm found in his brain by the Vs.
Anna checks in with Joshua who reports that they are moving ahead with the humans in the Live Aboard program, the experiments have already begun, just as she ordered. She asks, "How long until we can realize our goals?" We don't get a direct answer to this. And what are their goals? Hobbes is about to attach a torture device called a heretic's fork to their assassin prisoner, until he is interrupted by Father Jack. A heretic's fork is a real device that has been around since at least the Middle Ages and mostly known for its use during the various Inquisition periods in Europe. The Thompsons tell Ryan, Val, and Dr. Pearlman they can hide at their safe cabin in the Adirondack Mountains. The Adirondacks are in northeastern New York. 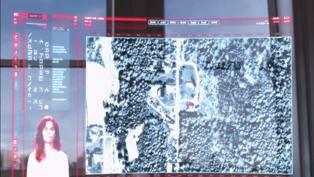 At 17:38 in the episode, Marcus' holoscreen displays images and information on Valerie in Visitor script. The blue words at top center say VALERIE STEVENS. The other words on the screen are too blurry to really make out. 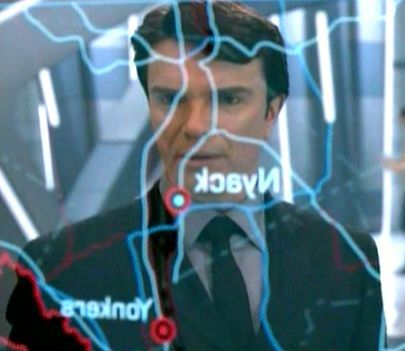 When Marcus displays a map of New York shortly after, the city labels on it are in the Arabic alphabet, clearly identifying Nyack and Yonkers; shouldn't they be spelled in Visitorese? 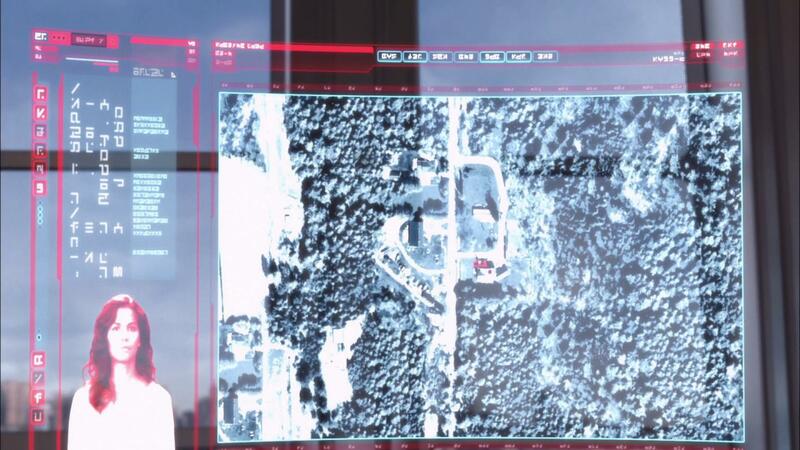 After the soldier pinpoints Valerie's location a Visitorese label appears on the map but it's too blurry to make out the characters accurately. After his surgery, we learn that Chad has no one close to him. His mother is dead and he apparently does not get along with his father. At 24:41 in the episode, Barnes asks the same question of Erica that Tyler does at 11:25. Tyler says "Name one bad thing the Vs have done since they got here. You can't, can you?" Barnes says, "You name one bad thing that they've done since they arrived. Do it! Do it! You can't, can you? You can't!" The V soldier seems to have a pronounced sense of smell, sight, and hearing compared to humans. Do all Vs possess these enhanced senses or just the soldiers? We see no evidence that Ryan has them. Ryan reveals that he is different from V soldiers. Soldiers are bred for fighting. Ryan was bred for work. This seems to suggest a genetic breeding program and class system at work within the V civilization. Valerie is leaving on a train at Nyack Station at 31:34 in the episode. As far as I can tell, this particular rail station is fictitious. Before leaving on the train, Valerie tells Ryan she doesn't want to see him again, that she doesn't forgive him. Ryan is stunned. Since the Vs are apparently only just learning emotions from humans, it's quite possible he has not felt the sting of a loved one's rejection before. How will he handle it? Might he move on to the emotion of bitterness? And, if he does, might he choose to betray humanity? Chad's discussions with Father Jack and Anna regarding the Fifth Column keep the audience guessing whether he's on the Visitors' side or Earth's. It's possible though that Anna has had something done during the brain surgery to make him loyal to her. Lisa's remarks to Tyler that he shouldn't live on the ship keep us wondering if she is trying to protect him or drive a further wedge between him and his mother. Earlier in the episode, Hobbes told the rest of the cell that he would turn Hobbes over to some people who will disappear him into a prison overseas. But at the very end of the episode, he marches Barnes into the woods alone and tells him, "First, you're gonna tell me everything you know about the V's. And then you're gonna beg me to kill you." This seems to imply that Hobbes kills Barnes and buries him the woods. Barnes' fate is never revealed after this.